250 tornadoes in the last six weeks in the United States – the sky is cutting us wide open. The Earth is crossing into our private property and making our personal effects public again. Ever been in a tornado? They are very loud. They roar with a shouting speech full of meaningful phonemes and gestures. Though we are weeping in our wreckage, the language of the storms is not merely madness. And it is remembered by us. Now we have to learn to speak Earth. It’s time to have that difficult conversation – high time. This isn’t the minor psychological adjustment of a Hollywood apocalypse, with the popcorn and fake butter. The car tumbling over the house is not made of pixels. It is the living body of the Earth that is speaking, and within this living thing reside we human beings. The roar of these hundreds of tornadoes is a chorus, a rough harmony, of all living things gathered in a strenuous, deadly debate. 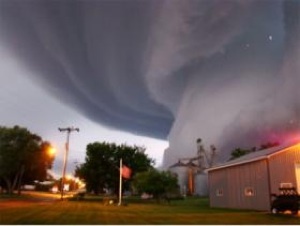 Our own screaming breath is circling in these tornadoes, mixed with a lot of life joining our horror. This is painful memory. Oh, we have a responsibility! The living things on this Earth – we are screaming to ourselves. For more from Rev. Billy and the Church of Life After Shopping, visit revbilly.com.